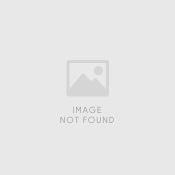 VaporJet TANCS vapor steam cleaners review and comparison. These heavy-duty portable steam cleaners use dry vapor and are great as commercial steam cleaners for businesses of all types; clean floors, walls, carpets, bathrooms, automobiles, boats, campers and much more. Fast, Free Shippng! Authorized Vaporjet retailer. The perfect steam cleaner for commercial applications in environments such as boat marinas, car detailing businesses, mechanic shops, retail stores and professional cleaning services. 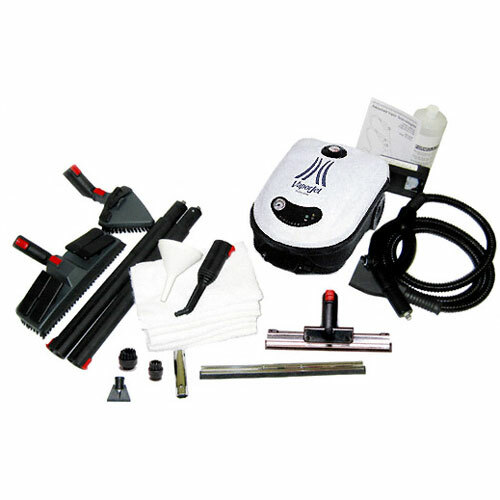 Faster and better than chemical based cleaners, the VaporJet 2400 TANCS Vapor Steam Cleaner is a one-stop-shop for sanitizing, cleaning and deodorizing everything from bathrooms to upholstery in one operation. 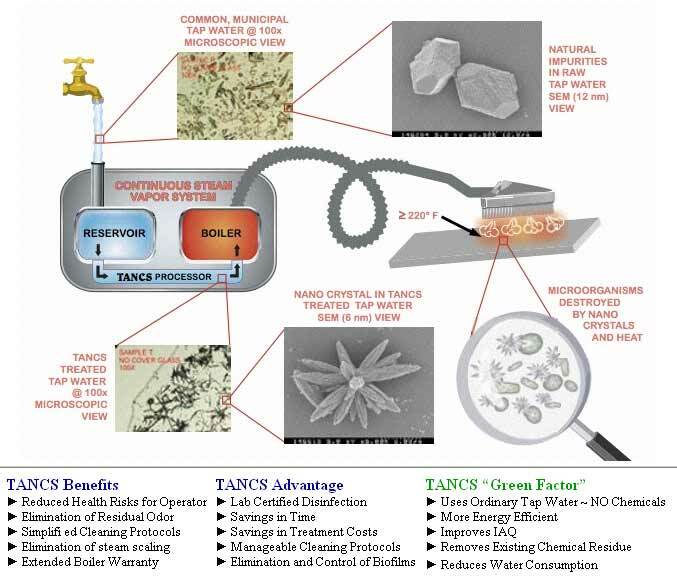 Now with TANCS, you can achieve the highest level of cleaning to kill germs, bacteria and biofilms for the deepest clean possible. TANCS is the only non-chemical based disinfectant that has an EPA registered number. You can re-fill this steam cleaner at any point without any annoying downtime thanks to its dual-tank continuous fill technology. The VaporJet 2400 TANCS is best for ommercial use and comes equipped with many professional grade tools and a convenient utility cart. Likes to clean in an organized way - comes standard with a sturdy utility cart with casters; can be used to hold your steam cleaner, towels and accessories; perfect for institutional steam cleaning. Certified by Nelson Labs of Utah, with well-documented research, TANCS is currently the only non-chemical based disinfectant process that has an EPA established number. Other benefits that make it superior to other steam cleaners include: reduced water consumption, reduced health risks to operator, longer boiler life, shorter drying times and elimination of residual odors. New Ladybug XL2300 TANCS come standard with a long warranty of 3 years on parts and 8 years on the boiler (per warranty terms). Don't need the super charged power of TANCS? We offer the VaporJet 2400 without TANCS. 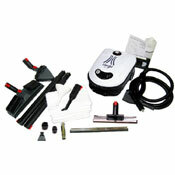 The VaporJet 2400 steam cleaners are ideal cleaning machines for commercial, industrial or very large home settings. These robust steam cleaners will give you deep cleaning performance and a sparkling, healthy environment like never before. Simply put, the VaporJet as it all - power, quality and price. The bottom line on the VaporJet is that it cleans better, faster and it is more resilient than any commercial steam cleaner in our line. Plus, this model is equipped with TANCS for outstanding disinfecting and sanitizing results that many other common chemical-based cleaners may never achieve. Its heavy-duty construction and high quality tools are designed for frequent and rigorous commercial use in business settings. We do not recommend the extra expense to anyone who is doing casual steam cleaning in a home. Plus an added enhanced accessory brush & tool kit worth $30 exclusive to AllergyBuyersClub which includes 6 toweling cloths, a bottle of formula 212 spot cleaner, and a filler pad for the large triangle and rectangular floor brush.